This image shows the sky around the nebula IC 63, nicknamed the Ghost Nebula. It was created from images forming part of the Digitized Sky Survey 2. The field of view is dominated by the bright star Gamma Cassiopeiae, which is having a profound influence on IC 63. 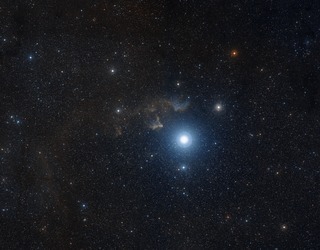 IC 63 is only one of several nebulous structures surrounding Gamma Cassiopeiae all of which are affected by the radiation emitted by the blue-white subgiant star.